Kokillen is a black iron imprint formed by the site and program molded in a volume that relates to the situation and public space surrounding it. It’s also a building that tells a story about the reason why there is a city in the first place. That’s a story starting with one material the extraction of iron. Kokillen Ekomuseum, is assembling 60 heritage sites in Bergslagen Sweden in a new Iron Industry museum. One of the sites, The Engelsberg ironworks, is considered to be one of the finest industrial monuments in the world, and was added to UNESCO’s list of World Heritage Sites in 1993. The sites include wooden manor, parks, smelting houses, blast furnace, forges, hammers, waterwheels, rapids, pig iron and bar iron production. 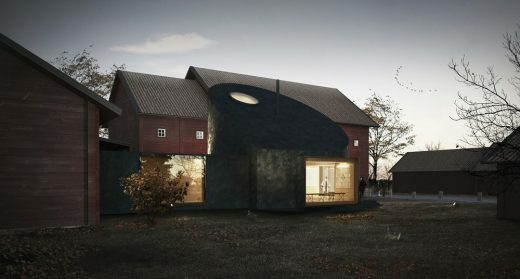 The site for the new museum is located in the middle Bergslagen in the city of Fagersta at Västanfors heritage and folklore centre and is surrounded by traditionally red-pigmented wooden log houses. The new building will serve as an entrance to the centre and the larger collection of heritage locations. 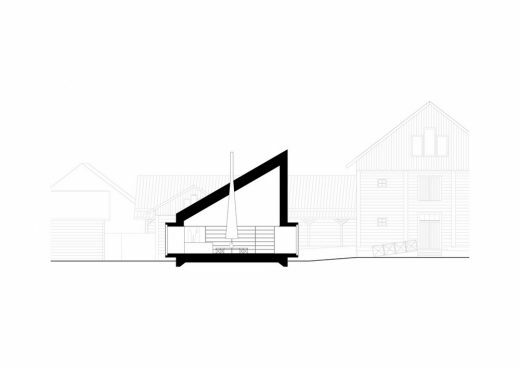 The greatest architectural challenge was to create a design that on one hand would blend in and relate to the situation and existing program and on the other hand would hold its own autonomy and character that represent a public building constructed to demonstrate the heritage of one of Sweden’s most prominent former industries. 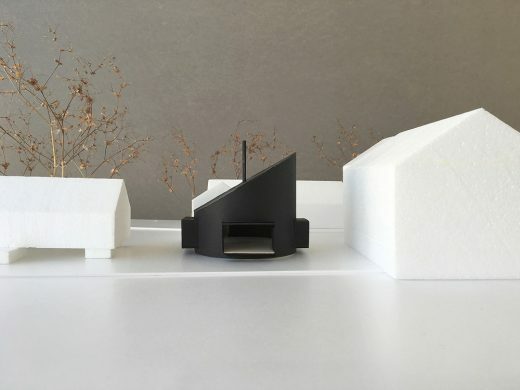 In introducing a new typology into the heart of the folklore centre the architects want to reclaim a language of diversity that once constituted the architectural toolbox of the former industrial landscape. 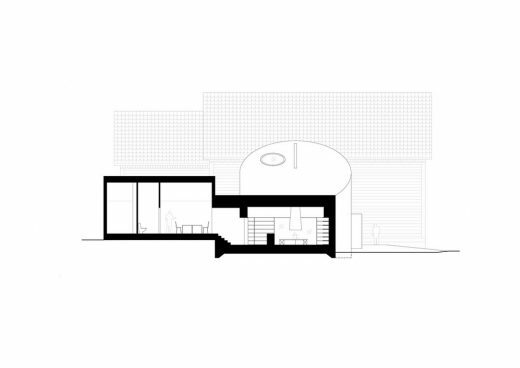 Buildings were pragmatic imprints sculptured in volumes that told the story of the activity inside. 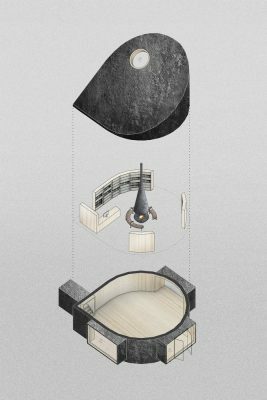 The building consist of a rounded shape clad in blackened iron that allows a spatial flow to continue and create a situation where the new museum appear like a piece of furniture in the interior of the public space rather than defining its borders. The old buildings will keep their dignity while the new museum attract attention and can act as a natural entrance to the area. The strong angled roof heals the irregularity of the surrounding buildings. 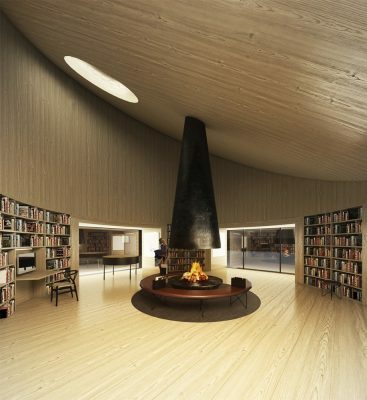 But even more so creates an interior that celebrates the irregularity that would be found in the old mines of Bergslagen and formally communicates the abstract image of a tilted crucible. 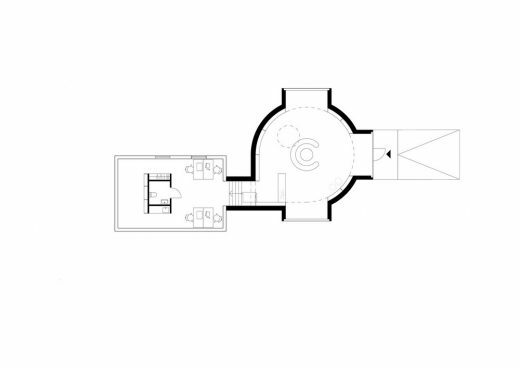 The interior is one open rounded space with extruded windows in four directions placed in a straight cross axis. 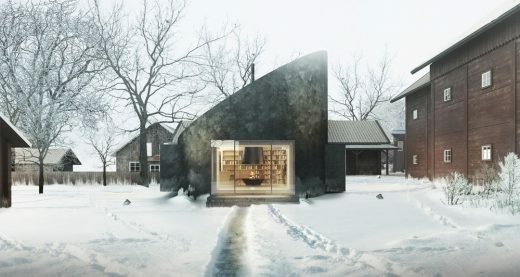 At the focal point the space, and of the entire cultural landscape that the museum serves to assemble, is a casted iron core with fire lit to send a warm welcoming to visitors entering the space. Kokillen was in 2016 one of the shortlisted projects in the WAN Awards category “Future projects”.